We know who’s really in charge of this castle. Oh yeah, kgy121 reminded me of something I’ve mentioned before, but not in a while, and it’s really relevant to this comic. Skärva can’t control his upper eyebrows at all, so you can often look at them to see how he’s really feeling behind how he’s trying to present himself. Not that he isn’t furious throughout all of this, but you can also see the moment he knows he’s lost. Haha, I knew it! I was wondering, by the way, is there time travel in this universe? Time travel is weird if you go backwards, but sending someone forward in time is actually pretty linear. Just freeze them or stop their personal time for a few hundred years. From their perspective that would be the same as time travel. When it was monochrome, I thought the sponge and bottle of cleaner was a cheese and a jug of milk. I can see that! Although there would have been something weird going on with the top of the cheese, and they really shouldn’t leave milk just sitting out. Unless this room is refrigerated, making it even worse for poor Cy. I kind of wish it was the larder anyway, just so it could be the bard larder. If you could convince someone to animate this, I would love to watch this show! 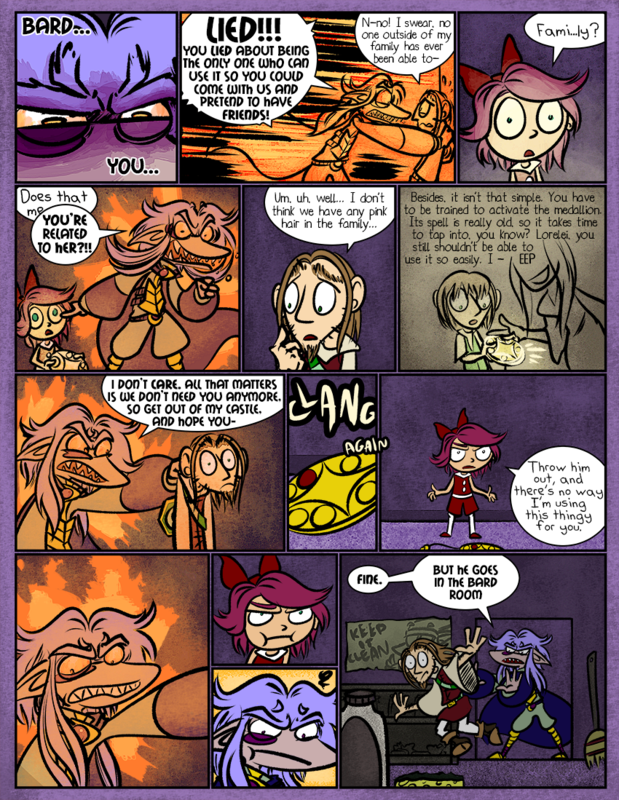 I have a feeling that Konton from last page’s comments might be on to something with the whole “amnesiac deity” idea. Like Zelda! Well, it’ll be a long time before you know for sure >:) Sorry about that! Keep theorizing though, we love it! It’s like Lorelei and Skärva (holy crap I just smashed random numbers into the unicode) are having a ‘hold your breath-off’. I wonder if they changed the bucket since last time he was in there. No where before the second to last panel has [email protected]’s eyebrows not being under his control been more evident. That was a lot less pretty looking than I thought it would. Lorelei has a big brother Cyril!! Eeeeeee! Okay I actually had a dream about the next page of this comic, which ended up being nothing like what you drew here, but it was cool. Family??? You mean we might actually eventually figure out who she is?? ?